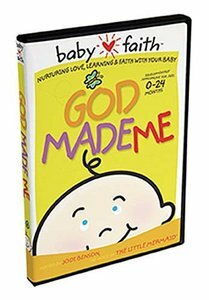 About "God Made Me (Baby Faith Series)"
babyfaith is the most stimulating, inspiring and nurturing faith-based program available for babies 0-24 months. You'll be delighted at how well babyfaith will hold your child's attention. babyfaith features best-loved hymns and baby-sized Bible stories told in a simple way. Plus, you'll introduce your precious little one to faith through the vital message, "God Loves You!" God Made Me is a baby's version of the Creation Story as described in Genesis, the very first book of the Bible. Your baby will begin to understand the important words, "God Made You!" and "God Loves You!" The seven days of creation are imaginatively and simply portrayed along with the vital message that "God made you " and "God loves you " Baby will see himself in the mirror as Mom reads the words "God loves you." The story of creation for your baby.